Update: According to The Irish Independent, the Labour Court has recommended that there should be an enhanced nurses practice salary scale in return for ‘productivity’ measures. The strikes have been called off. 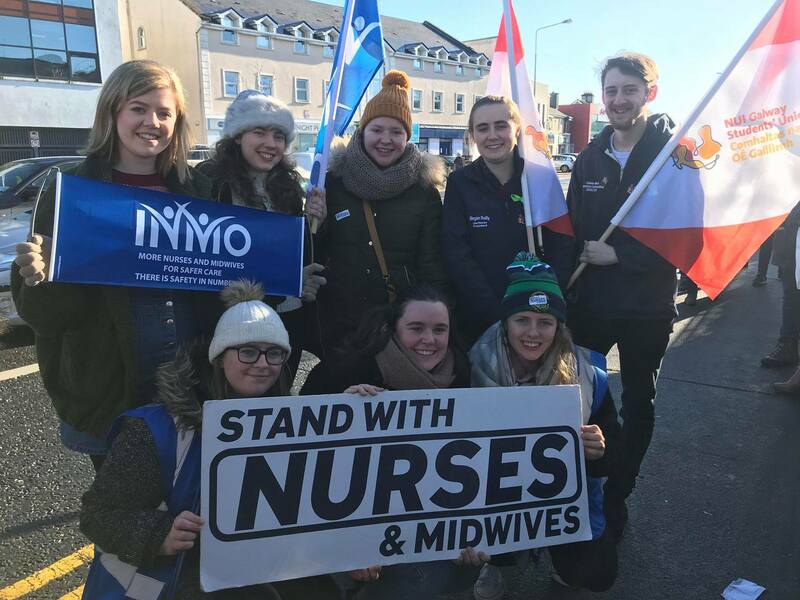 The Irish Nurses and Midwives Organisation (INMO) held a strike on Wednesday 30 January, with nearly 30,000 nurses all over the country taking to the picket lines. The INMO are calling upon the Government to introduce a 12 percent pay increase to bring Nurses into line with other medical staff. Other demands being made are for more emphasis to be put on staff recruitment and retention in what is a seriously understaffed sector. The INMO have also planned seven more strike dates, which are set to take place on 5, 7, 12-14, 19 and 21 February. This could see a possible 240 services going on strike throughout the month of February, with a national rally being held on Saturday 9 February. Ahead of the action happening this month, SIN spoke to some of NUI Galway’s student nurses, who are currently on placement in University Hospital Galway, to get their opinions on the strike and to see what life has been like being out on placement in the middle of an industry dispute. A third student gave her opinion on the strike in general, and why the nurses deserve pay restoration. Our first interviewee agreed, saying that she backs the nurses striking 100 percent. The INMO strike has caused uncertainty for student nurses on placement in all sectors. On the days of the strikes, nursing students on placement are not allowed to work for legal reasons as their supernumerary status could be compromised. As well as this, a second year Nursing student due to go on placement on the week beginning the 11 of February said that, despite supporting the strike, it will cause uncertainty for her. NUI Galway’s Students’ Union released a statement on Facebook supporting the INMO strike and posted pictures of the Union protesting alongside student nurses at UHG. “We were proud to stand in solidarity today with Nurses and Midwives as they went on strike,” the statement reads.